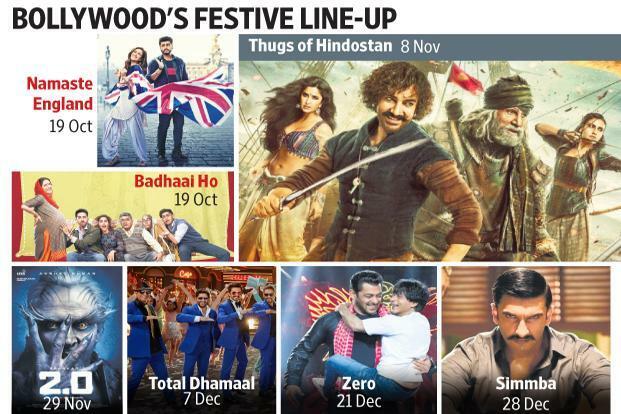 Home Â» Consumer Bollywood hopes for festive fireworks with â¹1,200 crore riding on last quarter A string of big-budget upcoming movies, including Aamir Khanâs âThugs of Hindostanâ, Rajinikanth and Akshay Kumarâs â2.0â, Shah Rukh Khanâs âZeroâ and Ranveer Singhâs âSimmbaâ are set to light up the festive season.Last Published: Tue, Oct 09 2018. 09 24 AM IST Lata Jha Aamir Khan has booked Diwali for his action adventure epic Thugs of H indostan that also features Amitabh Bachchan and Katrina Kaif. New Delhi: Bollywood is ready to put up its grandest show of the year yet. About 30 big-ticket movies are lined up for release over the next three months in what is traditionally the industryâs most lucrative period. âThe trend for the past decade has been that the really big-budget films are slotted beginning Dussehra and go on till Christmas. It is definitely the most important quarter of the year,â said Devang Sampat, director, India Strategic Initiatives, at the theatre chain firm Cinepolis India. According to Atul Mohan, editor of trade magazine Complete Cinema, about â¹ 1,200 crore rides on these big films slated for the last three months of the year. Clearly, what works in their favour is the trend of grand festival weekends paying off big time. âWhile Diwali has traditionally been and continues to remain the biggest attraction of the year, Christmas has emerged as another very promising pe riod thanks to Aamir Khan and his blockbusters that bring in anything between â¹ 300 crore and â¹ 400 crore,â Mohan said. However, this year Aamir Khan has booked Diwali for his action adventure epic Thugs of Hindostan that also features Amitabh Bachchan and Katrina Kaif. The Yash Raj Films production that the studio describes as âa Diwali spectacle promising jaw-dropping action, visual extravaganza and a larger-than-life cinematic experienceâ, is said to have cost â¹ 150 crore. Before that, Arjun Kapoor and Parineeti Chopra will usher in Dussehra with their romantic film Namaste England, directed by Vipul Amrutlal Shah. Set to release later in November is Rajinikanthâs delayed but much-awaited science fiction film 2.0, a sequel to his 2010 blockbuster Enthiran. It co-stars Akshay Kumar and its total investment is pegged at over â¹ 500 crore. The Christmas weekend has gone to Shah Rukh Khanâs Zero, a romantic drama where he plays a short man. The film is directed by Aanand L. Rai. Not giving Khanâs film much space to breathe, the year is set to close with Ranveer Singhâs action comedy Simmba, which is slated to hit theatres on 28 December. Plus, there are a bunch of exciting releases in betweenâ"from Ayushmann Khurrana-starrer Badhaai Ho to Total Dhamaal, a comedy starring Ajay Devgn, Anil Kapoor and Madhuri Dixit. Clearly, there is much to look forward to, especially considering that both Thugs of Hindostan and 2.0 will be released in at least three languages, the latest strategy to reach out to pan-Indian audiences. Trade experts expect this last quarter to trump the earnings of previous last quarters for clear reasons. âI see a combination of tent-pole and small, content-driven films lined up. This could definitely be one of the best quarters in recent years,â said Sampat, adding that the three months together have the potential to contribute nearly 28% to the yearâs ov erall earnings, more than the 22% average brought in by each quarter. Unlike the last quarter of 2017, which saw only two major hitsâ"Rohit Shettyâs comedy Golmaal Again and Salman Khan-starrer Tiger Zinda Haiâ"Mohan said this year has the added bonus of Rajinikanthâs 2.0, a Tamil-Hindi bilingual whose Hindi version will be presented by Karan Joharâs Dharma Productions. âThe year has already gone well with business reaching the â¹ 2,900-3,000 crore earnings of 2017. If the last three months turn out as expected, we could see a 20-25% jump over last year,â Mohan said.